Tell Gov. Rauner to sign the LGBTQ panic defense ban. Just click the link below to send him a message and add your name to the thousands of Illinoisans who support the bill. Today is the 48th anniversary of the Stonewall Riots. LGBTQ people, especially transgender people like Sylvia Rivera and Marsha P. Johnson, fought back against oppression, discrimination, and harassment. They fought for the fundamental right to lead an authentic life without discrimination or burden. Their bravery sparked the Pride movement we celebrate this month. As those early champions resisted and persisted, we have the obligation to keep the torch burning and ensure a world where LGBTQ people can lead authentic lives without discrimination or fear. 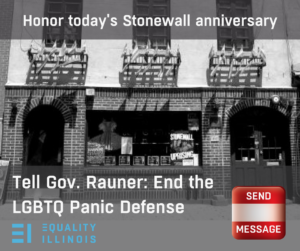 That’s why we advocated for the LGBTQ panic defense ban this year in the Illinois General Assembly. It’s time for Illinois to make clear in statute that LGBTQ persons’ mere existence is never a legal justification for physical violence against us. Now, it is time for Gov. Rauner to act.